His last assignment in the FDNY was Rescue Co. 3 in The Bronx. He served several years in Mayor Giuliani’s Office of Emergency Management. Tim spent two years on special detail to the federal government, serving as a special assistant to the Secretary of Health and Human Services during the Anthrax terrorist attacks in 2001-2002 where he was a founding member of the U.S. Department of Homeland Security. fire in Rhode Island, which killed 100 people. Tim helped the Governor manage the aftermath and stayed on to recommend changes to their emergency management system. Tim has been a leader in defending the memory of those lost on 9/11 at Ground Zero. He is a media commentator on the subject and has appeared on all major news channels including FOX News, CNN, MSBNC, CNBC and dozens of local news programs. Tim is a sought-after voice on the subject and has appeared in many documentaries. In 2011, two new documentaries premiered, the first from the American Center for Law and Justice named “Forever Changed 9/11 in Remembrance” and the second named “Rebirth”. Rebirth received rave reviews at the Sundance Film Festival, was purchased by the Showtime Television Channel for distribution, and won a prestigious Peabody Award in 2012. Tim’s difficult experience, as documented in the film, has made him a sought after speaker regarding Post-Traumatic Stress, grief, resilience of the human spirit and hope. He has been a featured speaker to numerous organizations, and has spoken at many colleges and universities, including the 2011 Vinfen Film Festival at Harvard Medical School. Vice President of the United States Joe Biden invited the Rebirth participants to the White House to screen their film to a group of psychology students. He was also a keynote speaker at the US Naval Academy Third Company banquet and was invited to give a TEDX talk at the University of Northern Illinois. 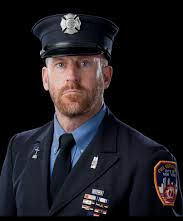 He has volunteered to aid and assist many charitable organizations including the National September 11th Memorial and Museum, Carry the Load, Ride2Recovery, and has helped to develop a new fundraiser benefiting the Stephen Siller Tunnel to Towers Foundation entitled the Captain Billy Burke Freedom Tower Climb. Tim Brown is a retired, decorated 20-year FDNY firefighter, and a survivor of the 2001 terrorist attack on the World Trade Center, a first responder to the 1993 terrorist attack on the WTC and a veteran of the New York Urban Search & Rescue Task Force team that responded to the 1995 terrorist attack on the Alfred P. Murrah federal building in Oklahoma City. Tim lost 93 of his friends on Sept. 11th. His last assignment in the FDNY was Rescue Co. 3. He served several years in Mayor Giuliani’s Office of Emergency Management. Tim spent two years on special detail to the federal government, serving as a special assistant to the Secretary of Health and Human Services during the Anthrax terrorist attacks in 2001-2002, earning his Top Secret government clearance while helping to build command and control into the Department. He also responded to the Station Nightclub fire in Rhode Island which killed 100 people. Tim helped the Governor manage the aftermath and stayed on to recommend changes to their emergency management system.